Photographs courtesy of the TMS Alumni Association in North America (TMSAANA). New York (TADIAS) — Established more than 90 years ago in Addis Ababa as one of Ethiopia’s premier modern educational institutions Tafari Makonnen School (TMS) was one of the most prestigious public schools in Ethiopia, graduating students who became the country’s first batch of diplomats, teachers, doctors, civil administrators, economists, senior military leaders, lawyers and professors. Now renamed Entoto Technical & Vocational Education Training College, those enrolled at TMS were recruited and trained from a pool of the nation’s best and brightest students. TMS was initially inaugurated on April 27, 1925, by its founder Ras Tafari Makonnen Woldemikael who was a regent at the time and later coronated as Emperor. 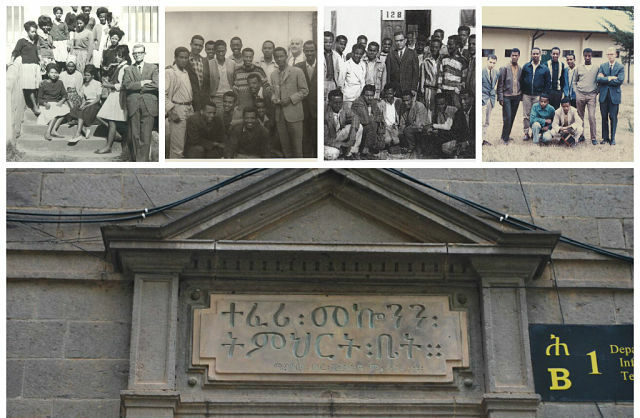 The school’s first Superintendent was Ethiopia’s first medical doctor, Hakim Workneh Eshete, who had previously served as Emperor Menelik’s personal physician. This school is an instrument which will operate on our country’s behalf through the knowledge which God gives to each of you according to your lot, once you have matured and have become vigorous in intelligence. So, I beg of you to help the school which nurtures you, give you the food of knowledge: to see that it does not shrink but expands, that it does not fall but grows in strength.